There were no entrance or parking fees collected at the Park between 1907 and 1930. These were the years in which the new state park was under the custodialship of the American Scenic and Historical Preservation Society which operated several parks and historical sites in New York State. The Society did not routinely charge entrance or parking fees to places under their control, so none were chared at Letchworth. Soon after the Genesee State Park Commission took control, a parking fee was announced for Letchworth Park. A August 28, 1930 news article titled "Paid Parking at Letchworth Park Decided" stated "In line with the policy of the state as carried out in other parks, the Genesee State Park Commission has ordered the inauguration of a nominal charge for parked automobiles occupying certain areas... on and after Saturday Aug 30, a charge of 25 cents for each automobile parked in the following area in Letchworth Park...." These places, according to the article were the picnic grounds between the Middle and Upper Falls comfort Stations and the the "Eddy Picnic area" near Wolf Creek. So when you parked in one of those parking lots, you paid an attendant 25 cents. This continued for 8 years. Then in May of 1938 the Commission published an "Outline of Parking in Letchworth Park" in area newspapers. Starting that season they explained, "the parking fee will be collected at the several entrances to the park instead of at the several parking areas as in the past at the rate of 25 cents per auto (not 25 cents a person). Busses or trucks 50 cents if carrying less than 13 persons, $1.00 per truck for over 12 persons, 25 cents per motorcycle." The article went on to explain that "this method will allow purchaser of a parking ticket the privilege to park in any provided parking area at no extra charge." The Commission also announced that a season ticket was available for only $2.50. 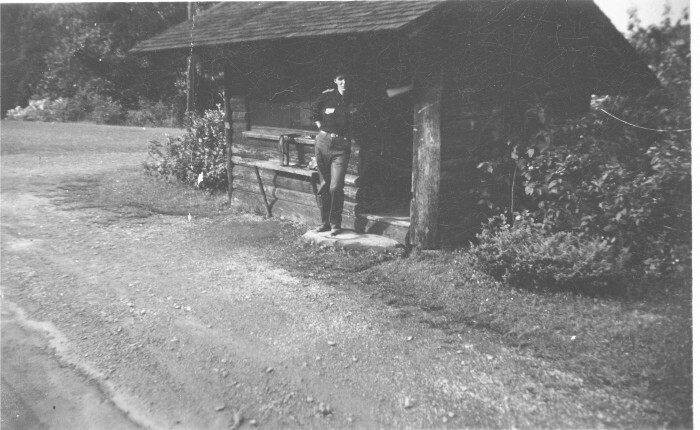 The two photograph below show what we believe to be the Portageville entrance around 1940. They were taken by the family of Garland Cummings whose father worked at the Civilian Conservation Camp at Big Bend in the 1930s. The Cummings family lived in Portageville. We thank Mr Cummings for sharing these images with us! Right: A park attendant poses in front of the first entrance gates. 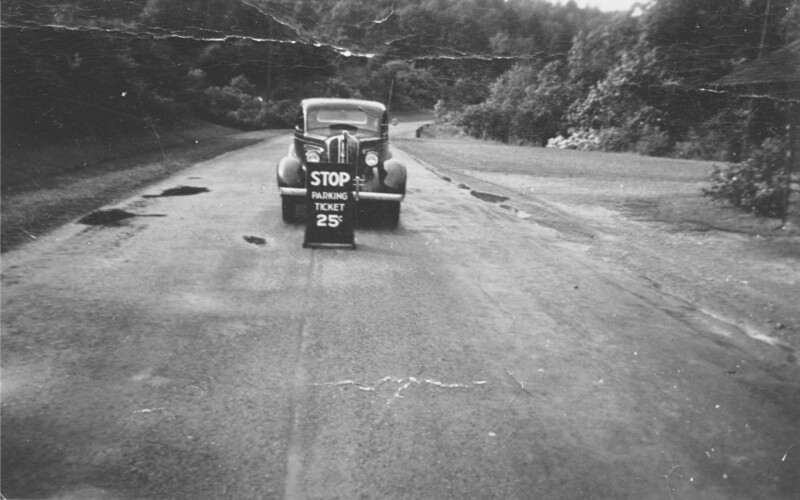 Below: A car (probably the Cummings auto) is parked behind the sign which greeted visitors when they arrived at the Park after 1938.